Perhaps the biggest change for the Director in Lync Server 2013 is that Microsoft has declared it an optional role in the Lync topology. In prior years the documentation treated it as recommended, especially when deploying external services. Microsoft isn’t trying to say that the Director isn’t needed anymore; but many organizations have pushed for Lync Server 2013 to require less overall server count in the architecture, and Microsoft has responded to these requests by providing flexibility within the deployments based on business needs. This same initiative can be seen with the movement of the Archiving and Monitoring servers roles to services on the Front End pool, and organizations can further reduce server count by deciding not to deploy Director pools. • Directors provide an additional layer of security from denial-of-service attacks at the Edge. Unauthenticated requests will never reach a Front End pool and affect internal users. • Anonymous web traffic for Lync simple URLs such as meet, dialin, and admin can be terminated at the Director’s web services. • Directors provide centralized authentication and redirection for environments with multiple pools. • Directors simplify the external federation and remote access signaling paths. A Director pool should generally be placed in a location where the majority of the user base exists since it will be the initial point of sign-in for all users. It makes sense to place a Director in a datacenter with a Front End pool, and it’s unnecessary to use a Director in branch office locations with small user counts. A backup Director pool with a slightly higher SRV record priority can be placed in a secondary datacenter. This ensures that internal clients can still locate a Director for sign-in even if the primary Director pool is unavailable due to a WAN or datacenter outage. Another recommendation when planning for placement is to use a Director in any location where an Access Edge server role exists. This way, as unauthenticated traffic from the Internet is passed to the internal network, the Director is just a short hop away from the Edge server and can authenticate the traffic quickly. 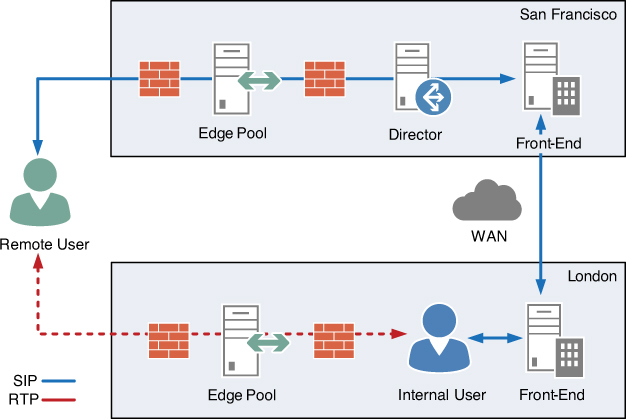 If the Director were in another physical location, that traffic from an Edge server would have to traverse a WAN connection before even being authenticated. In remote locations where it might make sense to deploy an Edge server to support local media paths, it isn’t necessary to deploy a Director. This is because the signaling traffic a Director sees is used only between the Access Edge server role and the Front End pools, unlike the media paths that flow between the endpoints shown in Figure 4. Figure 4. Signaling and media paths with a Director and Conferencing Edge server in an additional site. For those migrating from Office Communications Server 2007 R2, the licensing situation around Directors and high-availability was always a confusing topic. In Office Communications Server 2007 an administrator had the option to deploy both Standard Edition and Enterprise Edition Directors, which caused some confusion around deployment methods and licensing. Back then, Directors could be deployed either as an array of multiple Standard Edition Front Ends, or as a pool of multiple Enterprise Edition servers with a dedicated back-end SQL server database. These options were simplified with Office Communications Server 2007 R2, and the only option for Director high-availability was a pool of Enterprise Edition servers. This simplified the options, but the model was problematic because a pool of Directors would create their own databases that matched the same name as the Front End pool. To alleviate this issue, an entirely separate SQL instance was required to separate the two. In Lync Server 2010 this was again simplified and Directors no longer have a Standard Edition or Enterprise Edition designation. The deployment model now more closely resembles the array of Standard Edition servers option from Office Communications Server 2007, in which each server has a local database instance. This solves the duplicate database name issue and makes the deployment significantly easier because no SQL server setup is required. Nothing has changed from Lync Server 2010 in Lync Server 2013 as regards this model. Directors are still deployed as a single-computer pool or a multiple-computer pool for high-availability. The Director role also does not require a Standard or Enterprise Edition license in Lync Server 2013. In Lync Server 2013 each Director stores its information in a local SQL Express 2012 database instance. This change alleviates an issue found in previous releases in which a Director used the same back-end database name as the one for the Front End servers. With the Front Ends and Directors using the same database name, it became impossible to use the same SQL server instance for both functions, which meant that a new SQL server or SQL instance had to be provisioned exclusively for the Director pool. The other downside was that a Director has a relatively low usage of the SQL server, so providing an exclusive server or instance was generally considered a waste of resources. Continuing to use a local database instance in Lync Server 2013 will allow more businesses to include the Director role in their deployments. The Director role cannot be collocated with any other server role in Lync Server 2013. It must be installed on a server with no other roles to be fully supported by Microsoft.